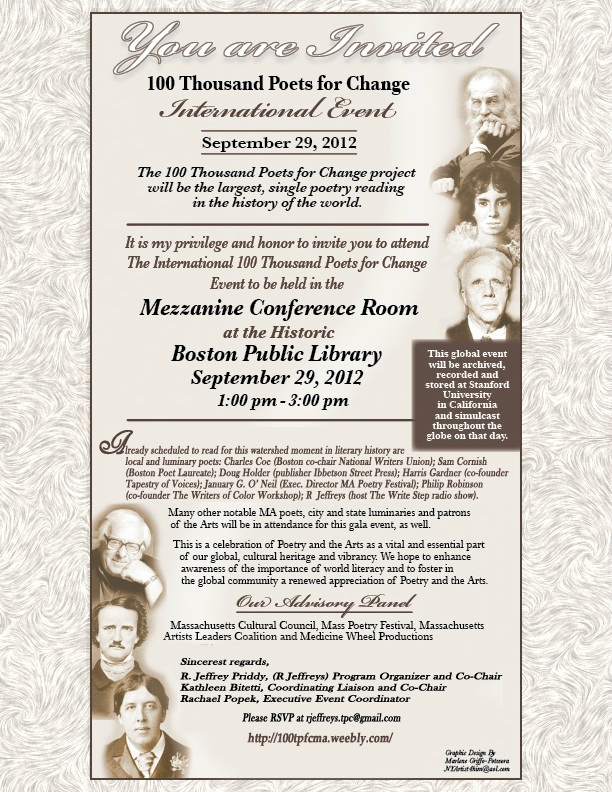 The great state of Massachusetts is going to take part in the international, “100 Thousand Poets for Change” event! Poetry readings will occur throughout the Commonwealth on September 29, 2012. The kick-off event is slated to be held in Boston, our state’s capital, at the historic Boston Public Library. Come celebrate a day of poetry! Saturday, September 29th from 1 pm to 3 pm at the Boston Public Library, Mezzanine Conference Room, Main Branch, Boylston Street, Copley Square, Boston, MA. On September 29th, 2012 the "100 Thousand Poets for Change" project will be the largest, single poetry reading in the history of the world. This event will also be archived, recorded and stored at Stanford University in California, and simulcast throughout the globe on that day. This is a celebration of Poetry and the Arts as an essential part of our global cultural heritage and vitality. Our goal is to turn the narrative of civilization towards peace and sustainability. “Peace and sustainability is a major concern worldwide, and the guiding principle for this global event.” ~ Michael Rothenberg, Co-Founder of 100 Thousand Poets for Change. This historic global event is free and open to the public. Many local and notable poets, writers, artists, musicians, city and state luminaries and patrons of the Arts will also be in attendance for this gala event. Our Massachusetts advisory team is: Artists Under the Dome, Massachusetts Artists Leaders Coalition (MALC), Medicine Wheel Productions, The Massachusetts Cultural Council (MCC), and Mass Poetry.org (Mass Poetry Festival). Please click here to see how your community, town and/or city can participate! 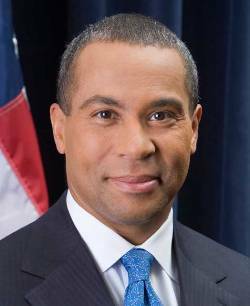 We are honored to have received a signed, letter of commendation from his Excellency, the Governor of Massachusetts, Deval L. Patrick. 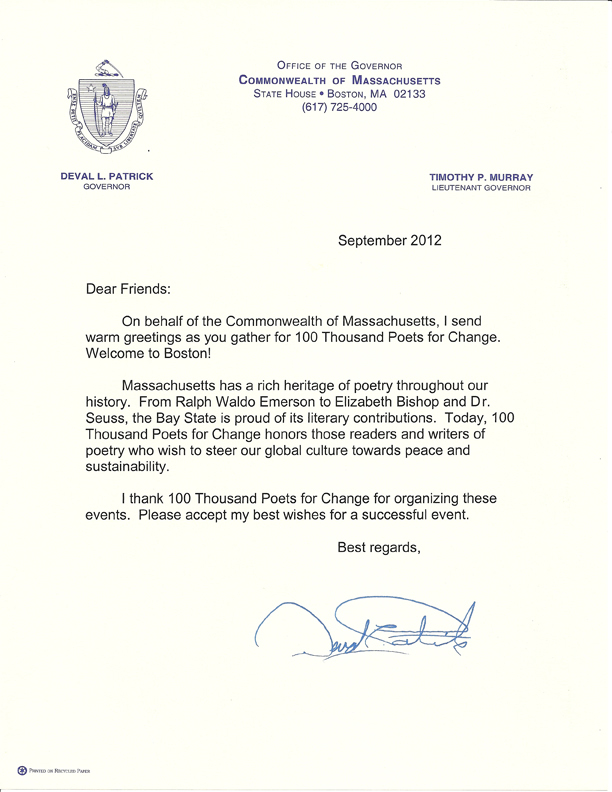 The letter is in appreciation for hosting the Boston, Massachusetts chapter of the international 100 Thousand Poets for Change project. This event is free and open to the public and You are invited! For Chrome and Safari only -- for all other browsers click the "Print Invitation" tab above. *This year’s Global Event - September 29th, 2012! community picnics, awareness events, parades, concerts, and more! Visit www.100TPC.org for news about other global events. * If you’re interested in hosting your own event in MA you still have time.